Wolmar: Let’s face it: we’re talking about a technology that will never happen. There may be some driverless cars going round Phoenix in a very limited way but the owners, Waymo, which is part of Google, are very secretive about precisely what they’re doing. The hype is being driven by carmakers, desperate to lay claim to the future, and tech giants, who have all this footloose capital that they don’t know what to do with. So they imagine their next big thing will be driverless cars. In fact, most of the driverless-car experiments we read about are actually cars containing drivers who can take over in an emergency. It’s as much of a fantasy as the jet-powered backpacks that used to be in the Beano that I read in the 1960s. Wolmar: I drive a 15-year-old Skoda! Sutherland: …and my car has something called ‘adaptive cruise control’. You set the maximum speed, then it has a kind of radar sensor, so it stays a set distance away from the car in front. It drives by moderating its speed, right up to the limit you set. This makes motorway driving both easier for me and also a good bit safer. 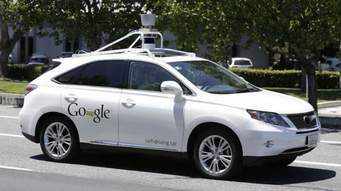 Wolmar: That is by no means a driverless car. Sutherland: But it opens up possibilities. You could add a metal wire along each lane, so all traffic stays in the same lane, and then you could create convoy motoring quite easily. A large number of driver hours, particularly if you are a trucker, are spent on America’s interstate system. If you allowed truckers to latch on — electronically — to a truck in front, then they could relax. Provided the driver at the front wasn’t a deranged lunatic, that is. Wolmar: There are six levels of automation of cars. Level zero is no automation. Level three would mean you are driven for about 80 per cent of the time, but you have to be alert at all times because the car is not ready to deal with all situations. That’s in theory. In practice, Ford found drivers fell asleep on the motorway because it was too boring. So they had to abandon the whole thing. And you know what? For many journeys in Europe, we already have driverless cars — we have large convoys with only one driver at the front. They’re called trains. They work. So these driverless-car convoys won’t happen. Sutherland: Certainly airlines discovered a fundamental problem with an autopilot. If it hands over very hastily to a less than alert pilot, you create this catastrophic hiatus. Take the Air France crash. One second, everything is going fine, then the Pitot tube freezes over so the autopilot doesn’t have a correct measure of airspeed. Then the pilot essentially goes from playing with his laptop to sheer white-knuckle terror in the space of one second. At which point it’s hugely difficult to work out what’s going on. The other problem is that you might end up with pilots who spend most of their flying hours with an autopilot, so they lose the basic intuitive skills that, say, a Sully Sullenberger had when it comes to landing a plane in a river. When the engines failed on that BA 777 coming in from China just short of the runway at Heathrow, the pilot instinctively added another few degrees of flap at the very last minute, enough to clear the fence at the end of the runway. Nothing in any book told him to do this. Perhaps no algorithm would have done this, but his instinct did. The ability to fuse completely unexpected combinations of circumstances — and then to respond non-catastrophically — is an art in which humans have millions of years of evolved experience. Wolmar: Let’s move on, and take this down to a more basic level. If you stand in front of a driverless car, it has to stop. The law of robotics says it can’t move. Once that happens, the interaction between pedestrians and drivers changes. What’s to stop people walking into the street, knowing that a driverless car will always stop for them? Or if you want to rob the occupants of a driverless car, you just stand in front of it while your mates smash their way in. Sutherland: You could probably ‘hack’ a driverless car with three or four balloons attached to 10p pieces placed in a particular configuration in the road. That would, basically, block the road. It would be very easy to walk out in front of cars, to make them lurch in an amusing fashion, because they can’t hit you. So people may suddenly start to abuse their position as cyclists or pedestrians. That does strike me as a problem. Wolmar: Now, I’ll accept that those driver-less pods taxi-ing passengers to the carpark at Heathrow along a guided track are fine. It’s akin to a guided railway, really. But let’s not pretend that this is a revolutionary change. Let’s not pretend that driverless cars will make any real change in the way we live. Wolmar: And killed four people. Sutherland: … and he was sent down for ten years — which seems pretty heavy, given there was no intent. Now, you could fit every single truck with a beeping device for a few hundred quid. The real flaw in that case, if you ask me, is that these devices haven’t been made mandatory already. Here, automation could save lives. Wolmar: But humans do, too. Drivers probably avoid 1,000 different accidents every mile. You judge things. Our eyes are an incredible asset. The first animal that developed eyes came 350 million years ago, and it took most of that time to develop these sophisticated eyes of ours. The computers are nowhere near doing that. And the artificial intelligence of computers is still binary. In Las Vegas a couple of weeks ago, a driverless bus was on a pre-set route and stopped because a truck was reversing towards it. But because this bus is stupid, it didn’t think: ‘Oh dear, this truck hasn’t noticed me, I ought to do something about it.’ So there was nobody to sound the horn, nobody to reverse out of the way or shout a warning. So the truck reversed into the bus. Sutherland: You also have to ask, if the technology were possible, whether driverless cars really would be transformative. You can argue that the washing machine was more important than the internet, as it allowed women to enter the workforce. Previously, to maintain a household, two days of the week had to be spent essentially doing laundry work. If you think about it, the difference between having a driverless car versus a normal car is pretty trivial compared with, say, the difference between having a normal car and no car. Wolmar: If I were dictator of London, I would ban all private cars and set up a very intense system of minibuses running along the main roads, one every 30 seconds, so you just walk to the main road. After that, you’d have a system of taxis, which would be very cheap, to take you the last mile. You would cut congestion by probably 90 per cent and have rational use of space. That’s a much better nirvana than the idea presented by the tech companies of these driverless pods spinning around everywhere. But you can only do this by being completely undemocratic, because people would squeal like hell. Sutherland: I don’t want to turn the system Soviet, where you have lanes reserved for the nomenklatura. I think everybody has a right to drive down the Mall once a year in their Jag — or Skoda! Maybe to pick someone up from hospital, maybe because you just feel like it. So I would introduce a progressive congestion charge, so everybody gets three trips into London a year for free. Then it’s £10 for the next three, £20 for the next three and so on. Behavioural science says people would save up their trips for when it was either important or enjoyable, which is how it should be done. Wolmar: What we’ll see before driverless cars is e-bikes, which have a small motor in them so if you pedal a few times, you get up to 20 mph. They are great fun, but at the moment quite expensive — about £1,500 — and dangerous. When I tried one, I suddenly felt I was going far too fast. But I am fairly pessimistic about the general direction of the debate. There isn’t a sufficient understanding of the damage caused by transport. Nor is there a model that creates the price incentives to improve things. The fact that it is still free to drive your car into very congested areas apart from the centre of London is ludicrous. I just think that nobody has got to grips with the question of what do we want out of transport. Sutherland: I’m more optimistic. And if I were transport dictator, I’d just make transportation fabulous. We can do that. Our perception of time is highly elastic, and the quality of journey time is much more important than its duration. Electronic gadgets have made time spent on a train rather productive, in fact. If you ask me, the £6 billion spent on making the Eurostar journey faster had about an equivalent effect to the hundred million or so spent making St Pancras station glorious again. I once suggested skipping the speed increases and instead putting supermodels serving free Château Pétrus to passengers on the Eurostar. That way you could save £5 billion on track improvements: people would ask for the trains to be slowed down. Less spent on engineering technology and more spent on psychology — that could hugely improve transport at a relatively low cost. That’s my policy. I am, basically, a romanticist.